The value of your business IS our business. You’ve worked hard to build your company and now it’s time to consider the future. But how do you equate years of blood, sweat and tears into fair market value? That’s where The Value Builder Score comes in. 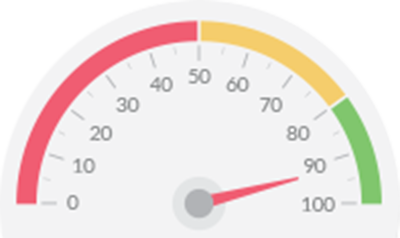 The Value Builder Score is a business assessment tool that evaluates your company as a potential buyer would, and includes a deep dive into The 8 Drivers of Company Value. To receive your company’s Value Builder Score, and learn more about how to leverage these eight key drivers to increase your business’ value, click here. Companies with a score of 80+ are predicted to receive offers 71% higher than the average business. 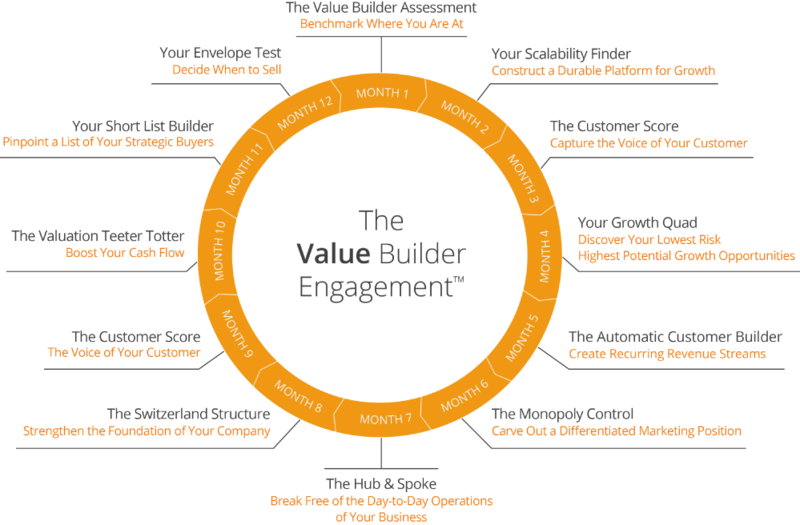 The Value Builder System™ implements proven strategies and tools that develop businesses to their maximum value. As Certified Value Builders (CVB), HartmannRhodes will walk you through a series of modules designed to transition you from working in your business to working on your business…all while increasing the value of your company. You’ve increased the value of your business and you’re ready to sell. Now what? The first step is to have a better understanding of how potential buyers will evaluate your company. These 8 Questions You Will Be Asked When Selling Your Business provide valuable insight and will prepare you for the process ahead. Selling your business can be complicated and every step is critical to receiving, negotiating and closing the absolute best offer. HartmannRhodes is a trusted partner with hands-on experience leveraging The Value Builder System™ to create, grow and successfully sell companies. Our principals are mergers and acquisitions advisors, business brokers and consultants who specialize in helping lower middle market companies with valuations between $1M – $25M minimize unforeseen issues and maximize profit potential. The partners at HartmannRhodes are successful entrepreneurs and Certified Value Builders. Our clients benefit from our years of practical experience as we act as their advisers and confidants. 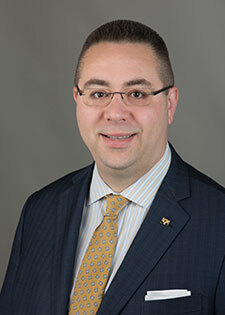 Mark Hartmann, MS is the Founder and a Principal of HartmannRhodes, a boutique middle-market value enhancement consulting, business brokering and mergers and acquisitions firm based in Morris County, New Jersey. He provides business value enhancement via the Value Builder System™ and mergers and acquisition as well as business broker services to entrepreneurs looking to increase the value or exit their organizations. Mark’s held numerous sales, operations and leadership roles in the insurance and healthcare industries during his career and is a 3-time Inc 500|5000 CEO. Professional Designations: Certified Exit Planning Advisor (CEPA) from the Exit Planning Institute, Certified Value Builder (CVB), Certified Mergers & Acquisitions Professional (CM&AP) from Kennesaw State University, and Certified Business Intermediary (CBI). Professional Memberships: The International Association of Business Brokers (IBBA), the Exit Planning Institute (EPI) and the Academy of Management (AoM). Education: Master of Science in Management with a concentration in Organizational Change Management from the College of St. Elizabeth, Convent Station, New Jersey. Volunteer: Member, Rotary Club of The Skylands (NJ). Assistant District Governor, Rotary International District 7475 (NJ). Board Member and Assistant Secretary, Park Avenue Club, Florham Park, New Jersey. Awards: Arch Klumph Society (AKS) and Multiple Paul Harris Fellow (PHF), The Rotary Foundation of Rotary International. 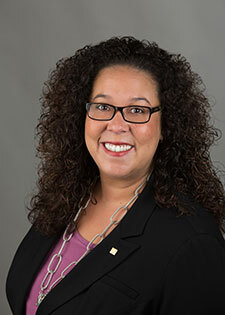 Shelby Rhodes, MBA is the Founder and a Principal of HartmannRhodes, a boutique middle-market value enhancement consulting, business brokering and mergers and acquisitions firm based in Morris County, New Jersey. He provides business value enhancement via the Value Builder System™ and mergers and acquisition as well as business broker services to entrepreneurs looking to increase the value or exit their organizations. She provides mergers and acquisition services to entrepreneurs looking to exit their organizations. Shelby’s held sales and sales leadership roles in the real estate industry during her career. Professional Designations & Licenses: New Jersey licensed Real Estate Broker Salesperson, Certified Value Builder (CVB), Certified Mergers & Acquisitions Professional (CM&AP) from Kennesaw State University, and Certified Business Intermediary (CBI). Professional Memberships: The International Business Brokers Association (IBBA), the National Association of Realtors (NAR), and the North Central Jersey Association of Realtors (NCJAR). Education: Master of Business Administration with a concentration in Marketing from Centenary College (now Centenary University), Hackettstown, New Jersey. Volunteer: Member, Morris County Board of Chosen Freeholder’s Women’s Advisory Committee. Past President and current Member, Rotary Club of The Skylands (NJ). Member, Chester Lioness Club (NJ). Past Gala Chairperson, Park Avenue Club, Florham Park, New Jersey. Awards: Arch Klumph Society (AKS) and Multiple Paul Harris Fellow (PHF), The Rotary Foundation of Rotary International. RE/MAX Executive Club. We are always on the look-out for experienced and motivated people to join our team. Currently, we have openings for business advisors with lower middle market M&A experience. If you are looking for an amazing opportunity with a growing company, contact us to learn more about a career with HartmannRhodes. HartmannRhodes Charities is a New Jersey non-profit corporation focused on helping community organizations with impactful community projects. Operating expenses are completely underwritten by The HartmannRhodes Companies allowing for 100% of all donations to reach their designated project. To learn more about HartmannRhodes Charities or to make an in-kind donation, please contact us directly at 908.441.4780. Volvo recently announced they will make their cars available on a subscription model where consumers will pay one fixed fee per month for access to a car which includes insurance and maintenance. Everything from tooth brushes to flowers are now available with subscription billing. Could you offer some sort of recurring plan to your customers?